Print your logo onto these custom printed reusable amity plastic coffee cups with cork band (350ml) or one of our other innovative plastic mugs and use them in your next marketing campaign as a unique giveaway item. 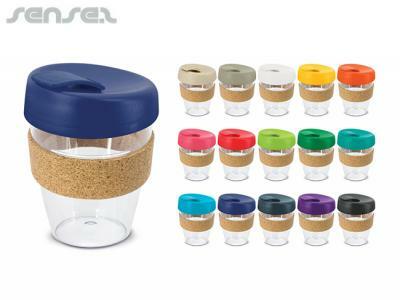 Our crystal clear reusable coffee cups feature a trendy heat resistant cork band and a secure screw on lid with a splash proof flip closure. These environmental friendly cups are manufactured from AS and the lid is polypropylene. All the materials used are BPA free and can be recycled. They can be presented in an optional black gift box which is available at extra cost. Colours: Cup: Transparent - Band: Natural. Colours: Lid & Flip Piece: Natural, Grey, White, Yellow, Orange, Pink, Red, Bright Green, Dark Green, Teal, Light Blue, Dark Blue, Navy, Purple, Black. Pad Print: Top - 45mm x 15mm, Bottom - 35mm x 30mm, Lid - 16mm x 25mm, Band - 40mm x 15mm. Prices shown include a 1 Colour print or an engraving in 1 position. Additional colour prints are available at extra $0.60c plus an extra setup cost. Custom brand these plastic cups or one of our best-selling promotional cups & mugs»plastic mugs with your company logo! Engraving your logo on the promotional reusable amity plastic coffee cups with cork band (350ml) is usually done by Laser engraving, where the laser removes a thin layer of the metal surface. Your logo becomes part of the reusable amity plastic coffee cups with cork band (350ml) and is impossible to remove. Sometimes the engraved effect will be a different metal colour to the outside metal coating of your product. We can also engrave wood or plastic. Engraving is usually a more expensive branding method. Personalize your reusable amity plastic coffee cups with cork band (350ml) or custom design plastic mugs for your marketing campaign. How can these unique promotional reusable amity plastic coffee cups with cork band (350ml) or our personalized plastic mugs fit in with your marketing strategy and help you maximize your brand exposure? Our custom made Reusable Amity Plastic Coffee Cups With Cork Band (350ml) can be produced from a minimum quantity of 50 pieces. We can have your logo branded on these corporate Reusable Amity Plastic Coffee Cups With Cork Band (350ml) in Engraved or 1 Colour Pad Print. A setup fee of US$126.00 will apply to make the film.